Resurrecting I, 2016, film still. Variant Sail #1, 2016, oil on board, 38 × 56 cm. The striking innovation of Mallarmé’s poem is its capacity for multiple and simultaneous readings, and the generative possibilities it presents. 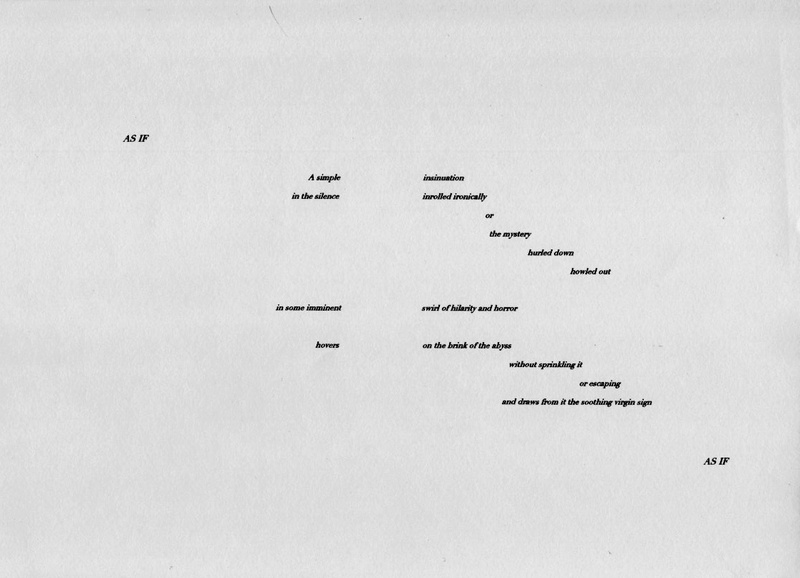 Through a close reading of the poem I suggest a new critical space for painting, leading to a simultaneous and sequential reading demonstrated in the spatial poetics of Un Coup de Dés. I propose that the poem marks the transition from a modernist absorptive mode of looking/reading to a postmodern theatrical and performative mode. I show that Mallarmé should be considered as crucial to our understanding and critique of the relation between content and form. 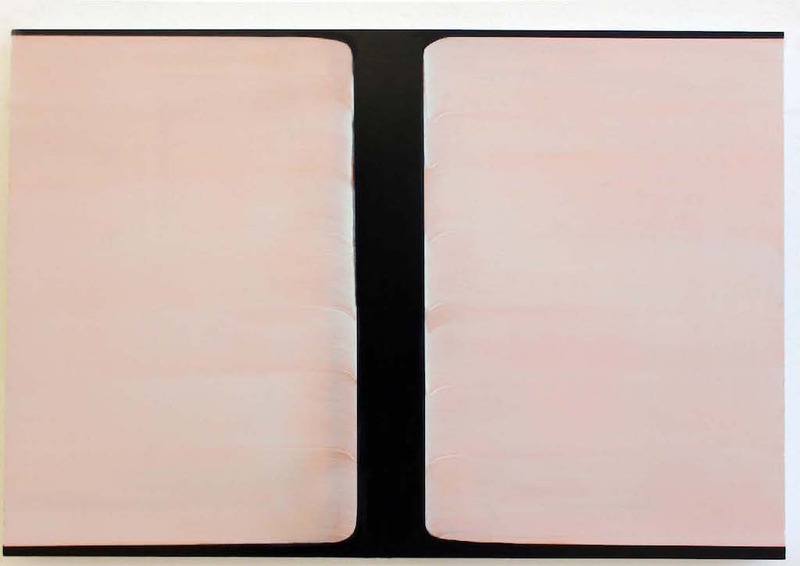 I demonstrate Mallarmé’s relevance to articulating the minimalist drive in painting through a re-appraisal of the structural and spatial organisation of the text, the grid and the blank page and the subsequent sculptural turn that led to a renegotiation of the space between the object and viewer. I use a number of performative strategies to engage with the text, drawing attention to the metaphoric possibilities of the space of the page and of the book. These include sculpture, painting, photography, film, and installation. Through a formal investigation of line, space and gesture, painting is presented as a language with its own syntax. My art work shows that what animates this relation is the embodiment of gesture as a movement towards the idea perceived, and that the viewer’s relation to the object is negotiated as a gap or a virtual space where meaning constantly unfolds. This research, conceived as a series of dialogues with Mallarmé, re-frames and re-articulates Un Coup de Dés. This takes visual and textual forms woven together, ‘establishing a direct relationship between literature and the plastic arts’.3 This research makes a contribution to Mallarmian studies, to current discourse of painting in an expanded field through a re-evaluation of the relation between the space of painting and poetry, and discourses that underpin spatial and temporal readings of the text. I demonstrated the importance of Mallarmé to trans-disciplinary research: that extant material from one field applied to another generates new forms embodied in this gesture. Mallarmé Me Marcel is one of twelve dialogues that take place across space and across time resisting a linear historical reading of the poem, yet supporting an art historical approach with an emphasis on what it means to be contemporary. These dialogues are presented as a set of coordinates that focus on points of convergence and chance encounters leading to the production of new work. I begin with a performative reading of La Novel Revue Francais 1914 version of Stephane Mallarmé’s poem Un Coup de Dés4 and Marcel Broodthaers 1969 version in which the word poem is replaced with the word image.5 Broodthaers replaces Mallarmé’s words with black strips, directly proportionate to the space occupied by the text, drawing attention to the visual and spatial form of the poem. 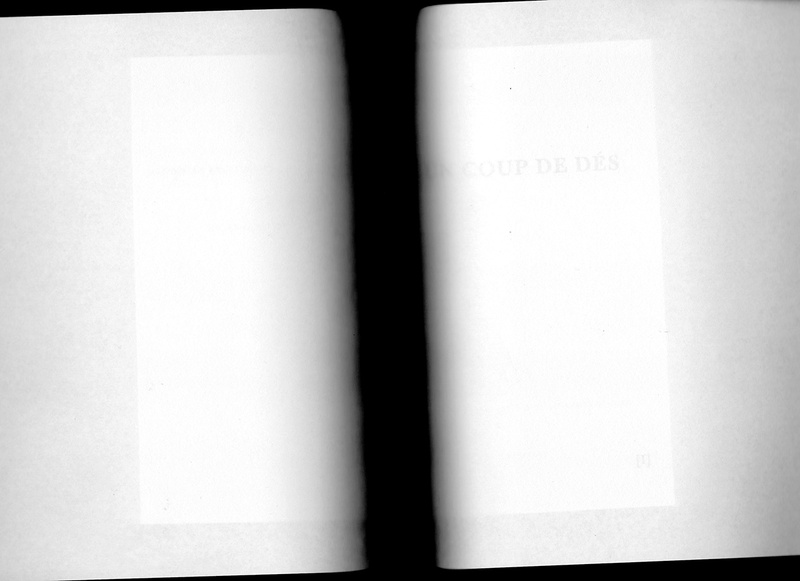 My reading will focus on the spoken pattern and spatial juxtaposition of the poem, sounding and re-sounding the words of the poem into the abstract space created by Broodthaers. Underpinning this dialogue is a broader conversation about the embodiment of sound in a gesture that draws attention to the syllable, to the line, the visual form of the words and the tension that exists between what we see on the page and what we hear. 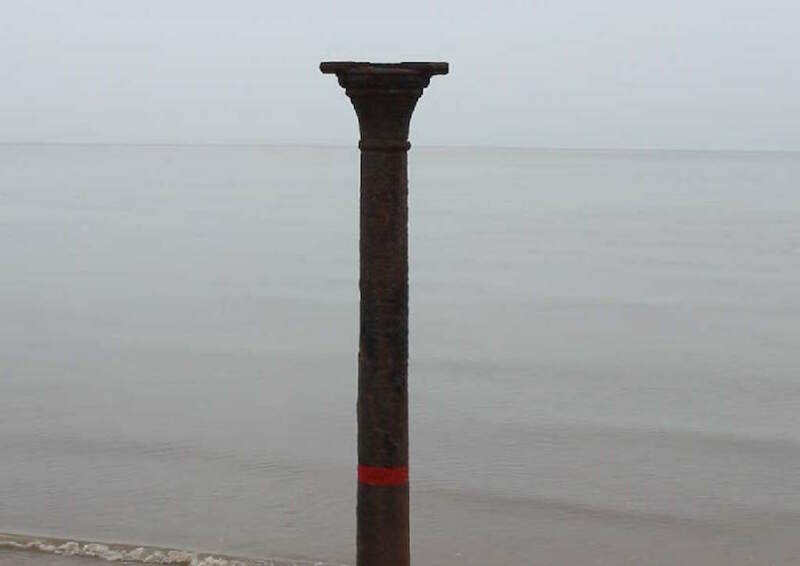 This reading is performed while walking towards the sea, towards the horizon line, situating Mallarmé Me Marcel in space and time and drawing attention to the vertical and horizontal axes. This intuitive strategy operates as a metaphor and as a metonymic device in order to address questions at the heart of this thesis, including a reconsideration of the temporal and spatial conditions of painting and poetry in the broader historical context if Ut Pictura Poesis. 1 Rosalind Krauss, Sculpture in the Expanded Field, The Anti-Aesthetic: Essays on Postmodern Culture, (Seattle: Bay Press, 1983). 2 Stéphane Mallarmé, Un Coup de Dés Jamais N’Abolira Le Hasard, first published in the English edition of Cosmopolis march 1897, single page format. For the purposes of this dialogue I refer to the (1898) manuscript annotated by Mallarmé prior to his death in 1898, with instructions for publication. In 1914 the first double page spread was published, The Bonnoit Edition by Nouvelle Revue Francais on behalf of Gallimard. It is this edition that Marcel Broodthaers uses to produce his re worked version of the poem. 3 Marcel Broodthaers, Catalogue Des Livres, 1957-75. (Galerie Michael Werner, Koln 1982), p27. 4 Stéphane Mallarmé’s, Un Coup de Dés Jamais N’Abolira Le Hasard, Nouvelle Revue Francais 1914 on behalf of Gallimard. 5 Marcel Broodthaers, Un Coup de Dés Jamais N’abolira Le Hasard, 1969, Galerie Wide White Space, (Koln: Galerie Michael Werner, c1969). For translation of Un Coup De Dés I refer to Stéphane Mallarmé, Collected Poems and Other Verse translated by E.H. and A.H. Blackmore, my preferred translation of the poem. Bernadette O’Toole is a UK-based artist and researcher. She is interested in the emerging critical space between literature and the visual arts. She has exhibited nationally and internationally, most recently at Ex-Libris Gallery, Newcastle University (2016). Her doctoral research explores relations between the textual space of Stéphane Mallarmé’s poem Un Coup de Dés and an inter-disciplinary space between painting, sculpture, and installation. A series of dialogues with Mallarmé re-frame and re-articulate Un Coup de Dés, weaving together visual and textual forms, ‘establishing a direct relation-ship between literature and the plastic arts’. Her work makes contribution to Mallarmian studies, to the current discourse of painting in an expanded field through a re-evaluation of the relation between the space of painting and poetry, and discourses that underpin spatial and temporal readings of the text.